Some studies have shown that an increasing atmospheric CO2 concentration reduces plant transpiration while others have demonstrated that it interacts with nutrients in soil to enhance plant transpiration and plant growth including an increase in leaf area. However, none of these studies has focused on plant-induced suction in vegetated soils. The objective of this study is to quantify transpiration induced soil suction by Schefflera heptaphylla in NPK (Nitrogen, Phosphorus, Potassium) nutrient supplied, heavily compacted silty sand under two different atmospheric CO2 concentrations (400 ppm and 1000 ppm). Three replicates of the plant were grown in NPK nutrient supplied silty sand and their plant characteristics and soil matric suction were measured under 400 and 1000 ppm atmospheric CO2 for three months. Due to the supply of nitrogen-rich nutrient in silty sand, leaf area index (LAI) of plant increased by 22% under 1000 ppm CO2 compared to 400 ppm CO2. Thus, the larger LAI induced higher soil suction substantially since no significant difference in soil suction was found between current and elevated atmospheric CO2. LAI of Schefflera heptaphylla could be a reliable parameter to understand and predict soil suction as verified by strong correlation coefficient (R2 = 0.85–0.98; P value < 0.1) of peak induced suction and atmospheric CO2 concentration. 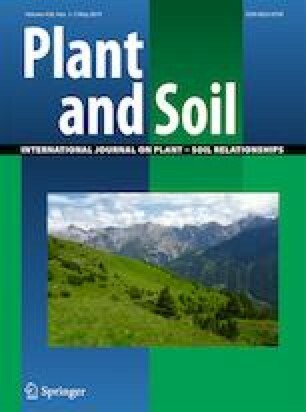 This study reveals that the use of vegetation in soil structures needs proper management with additional supply of nutrients to thrive under future atmospheric condition and to induce suction hence improve shear strength in vegetated soil structures. The authors would like to acknowledge the National Natural Science Foundation of China for grant 51778166, the 973-project scheme for grant 2012CB719805 and the Research Grants Council of the Government of the Hong Kong SAR for grant HKUST6/CRF/12R.